Income disclosure statements also known as earnings disclosure statements help to understand the business opportunity selling Young Living. In 2017 Young Living released an income disclosure statement about the commissions and bonuses earned by Young Living members. Usually, when people think about a good business opportunity, they are thinking about profit. Profit is money earned minus the expenses. The numbers throughout this disclosure don’t take into account any of the costs associated with selling Young Living. To get a better idea of profit we have to subtract any expenses for the year. Note that the compensation paid to members summarized in this disclosure does not include expenses incurred by members in the operation or promotion of their business, which can vary widely and might include advertising or promotional expenses, product samples, training, rent, travel, telephone and internet costs, and miscellaneous expenses. This means that if a member is making $0, or a very small amount of money it’s reasonable to assume that they are losing money selling Young Living. This is because their expenses for the above list would exceed their earnings. The disclosure statement makes reference to the vast majority (89.5%) of members who are “preferred customers.” These members have not sponsored anyone. It implies these members are just buying oils, but that isn’t the whole story. The best news for enrolling members is that choosing between becoming a Preferred Customer or a Business Builder doesn’t have to happen at enrollment! By purchasing a Premium Starter Kit (PSK) and enrolling as a wholesale member, you have 11 of our most popular essential oils to help you get started; your personal journey with Young Living will help you organically find your path as a Preferred Customer or a Business Builder. This really hides the number of people who are working to build a business (selling and recruiting), but didn’t make money in 2017. Instead, it characterizes them as customers. Anyone who has not sponsored someone falls into this group. We should not assume that most are customers. In 2016, Young Living did not have this “preferred customer” category and their disclosure looked much different. In the 2016 disclosure, 94% of members made a median of $0, with an average income of $1 (not including expenses). This $0 average included distributors focused on selling products instead of recruiting. This change in categorization aligns with the difference in average earnings. How about the higher ranks? The 2017 disclosure statement really only describes those who have successfully enrolled another individual. This accounts for 10.5% of Young Living members. One third of those or 3.5% of all members, get paid a median of $15 per month. The next rank, “star,” or 4.7% of all members and they make a median of $58 per month. Finally, the “senior star” rank has a median monthly income of $198 and makes up a little over 1% of all members. We looked at medians because the averages indicate that a smaller number of high-commissions are driving the averages up. Medians are a better indicator of what more people are earning for this rank. Business building ranks also have requirements though including a 50-100 personal volume requirement. This corresponds to $50-$100 or more in purchase requirements. Some of the “income” in this report really is earnings on these purchases (not sales). Check out the Young Living compensation plan for more information on the rankings. The annualized average income is misleading because a distributor’s rank can change over the year, a distributor can join or become inactive during the year. In all of those cases the annual earnings are lower. Young Living’s characterization of some business builders as “preferred customers” and excluding them from disclosures is misleading and hide the whole story. This income disclosure statement only gives an idea of income for those distributors who have already enrolled someone and does not include costs and expenses. Young Living gives a list of expenses that are important to consider. 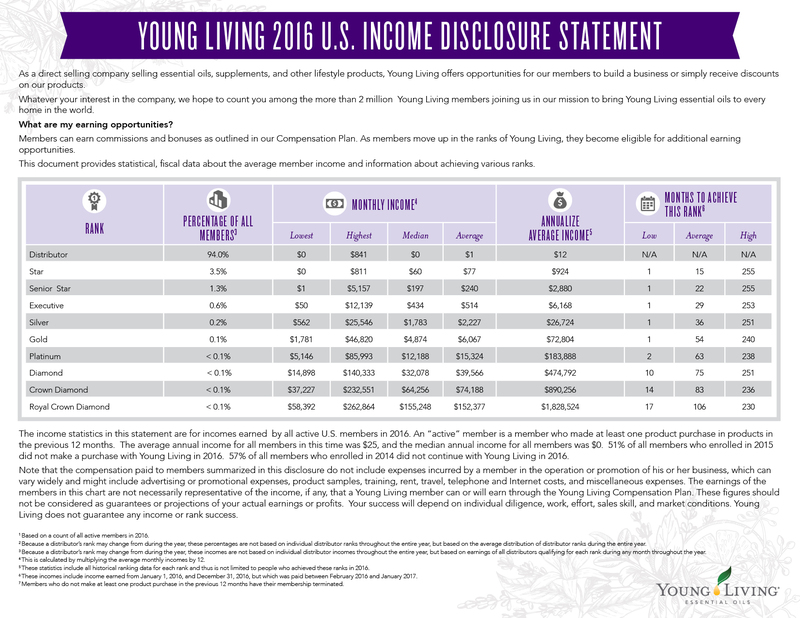 Looking at the 2017 and 2016 disclosures it’s clear most Young Living distributors do not receive income. This is true even without considering the numerous expenses Young Living describes. By and large, distributors and those working hard to sell Young Living are not profitable. No affiliation with YoungLiving. Please contact us with corrections or questions. I have to wholeheartedly disagree. I replaced my Microsoft income by sharing oils and the sky’s the limit. It’s not a get rich quick scheme. it’s a legit business with SO MANY PERKS. Several of my team members are getting ready to do YL full-time. It’s hard work but it’s a viable opportunity with NO CEILING. >I have to wholeheartedly disagree. What do you disagree with? These are facts backed by data. Did you find something inaccurate? I’ll further note: the data here shows clearly that there are a number of people who do get paid substantial sums by YL. This doesn’t mean that people on their team will also be successful. Everything shows most people are not paid much money even if they invest full-time effort. We agree, successful participants exist. The data shows successful participants are extremely rare.